There seems to be a disconnect about the anime-- which it why I'm writing this review. To start off-- yes, it is indeed fast paced. Most of the story is forgone in the pilot, and it's supposed to be that way. This is NOT the anime that you want to watch if you've never played P4 or watched Persona 4: The Animation. This anime is specifically made for those who have already seen or played it. This show is literally a New Game+; that is to say, just as in the game, the player has previously won the game, and is now replaying it with all of the stats from the previous playthrough carried over. We can see this in various ways just in the pilot. In the original anime, Yuu had developed from an introverted loner to a brave leader who excels in all trades. Yuu carries this personality over into the new anime; he doesn't need to develop into this person again. as Yuu responds to King Moron in the pilot, he calls him out on being a "fugitive." This is specifically a quote only available in New Game+, as if you tried on your first playthrough in the game, it would only respond that you didn't have the courage to say that. The powers Izanagi displays in the battly scene not only shows insane powers that are impossible for a new character, not to mention the toughness and number of the enemies which had been drastically increased. This suggests that Izanagi has overbearing (kuma!) stats gained from the previous playthrough, once again pointing out a New Game+ scenario. While I agree that the pacing was fast, it can be forgiven considering the premise. This is not a reboot of the previous anime, it's a continuation. Given that, it makes sense that they don't need to go over every previous plot point, as the anime works on the premise that you already know all there should be to know about the story line. After all, when you replay a game, haven't you ever mashed the skip button to speed things along that you already know? he's in a New Game Plus. For those not in the know, sometimes when you beat a game, you get the option to carry your stats/equipment/etc over to a new save file, and blast through the game. Yu clearly has max personality stats (which were a thing in Persona 4), and his Persona Izanagi was using moves that it shouldn't have had until the VERY end of the game. He also seems to be somewhat aware of what's going to happen, outside of events that didn't happen the first time around, such as hanging out with Marie. If you're a fan of P4, it's an absolute must to watch. If you're not, either watch the original anime or play the game, or else you'll miss out on a LOT, since they seem to be blitzing past the rest of the plot. But not for the average person that's never played the game. The art was pleasing and the sound was also. The only thing is, is that they skim over some of the plot, which that means people who haven't played the game or watched the original animation, will have a hard time to follow. From my look on it, this protagonist (Yu Narukami) is on his New Game + run, which means he has much more personality and not as bland as the original, and has most of his persona powers from before, like the Myriad of Arrows Izanagi did. Like I said before, people who never played the game might not get it as thoroughly. I am a bit sad though that it does skip some of the story, that's really my only gripe about it, but either way it seems like a great anime for the long time fans, but not the average joe that doesn't know anything about this game. I just wish there was a bit more "Meat" to it though. ...then the anime series will sure be a hit. Persona 4 Golden, (the game) was a great game, interesting plot and took hours of my time. The game itself felt more like an anime and you got the #feels as you took care of the cast and built relationships with them. The game was a true masterpiece and totally deserves a lot of credit. Without spoiling it for others, the first episode did not disappoint and bought back fond memories of the game, (including the opening theme and majority of the music in the background). The cast is the same and as I have played the games already feel a connection to them, (and if you have not played the game, you will get to know them to I'm sure in this series). If you have not played the game and love your JRPGs, I urge you to go pick it up. It has tons of replay-ablity, (you really can lose hours in playing this one). Hoping for an awesome series to follow. Persona 4 was a old PS2 game originally released in 2008, at the time it was hands down the best game on PS2. Then a few years later they adopted Persona 4 and made Persona 4 Golden exclusively on PSvita and thanks to the added content it quickly became one of the best PSvita games out there and I still play it to this day. But now, a few years later they've adopted P4G on vita and made it into a anime. Now is this good or not? Well, that question is hard to answer. I liked it a LOT... However, I can't say that this is a master piece like it's predecessors since you must have watched the old anime or played the games to fully understand what's going on in the story. I liked that they dedicated themselves to the true Persona fanbase whit the anime, however I can't give this 5 stars since it's not newcomer friendly.Should you watch? Yes you should, Persona is one of the best franchises out there. Just don't start whit this one. More like a series of bonus scenes/episodes than an actual series. This anime is intended for people who have watched Persona 4 The Animation or beaten the Persona 4 game. This series basically skips around just showing the scenes/plotline of the character Marie, who was added in the Golden version of Persona 4, assuming you know everything else that happens in the normal game/show between these scenes. If you've seen Persona 4: The Animation, or beaten the Persona 4 game, you'll find this enjoyable. If not, it won't make any sense at all. This anime is for people who have watched the first one as the anime is about Yu in a New Game Plus mode. This is why Izanagi is so powerful and all the character building is skipped as the anime is an addition to the original series and if you have played the game or watched the original anime then this one will be a treat to watch. If you played P4G, you might like it. Now why 2/5 stars? Well the show focuses on the Aeon Social Link, Marie's Social Link. Which just so happens to be my least favourite social link in the game. Marie grinds my gears, mostly because I've never liked the tsundere character, I think it's a weak character archetype that lack depth and cause needless conflict. There are positives, the animation is much better then the previous animated series. But other than that, I don't see why this needed to be made, this could have been a quick 5 episode OVA, but they stretched it to 12 Episodes. Honestly, only watch it if you played P4G, even then, there is not much depth to this show. Rather disappointing, and I'm a huge Persona fan. Can't defend something that just isn't great. This is my first review on this site so please take it easy. This follows Yu Narukami in New Game+ mode this means you must have prior knowledge of the Persona 4 story and characters. That being said this anime focuses more on Marie and as someone that played both Persona 4 and the Vita remake Persona 4 Golden this becomes Marie the Animation and less and less about Yu minus episodes 6 and 7. Though I do like how they incorporated the two new Social Links from Persona 4 Golden into this. Animation is done by A1-Pictures so you know the animation is gonna be good and it is; nothing more to say about that. The voice over is the same as the game and the original Persona 4 The Animation, however I can't really say anything about Marie's VO because I'm used to the english VO, but it's still good. While I am enjoying this anime I can't recommend it to those who haven't played the game(s) or watched Persona 4 The Animation that's why my grade for this is a C-, or a 6/10. To those of you that do have prior knowledge then this is a no-brainer and my grade is a B+, or an 8/10. meant for those who truly love persona 4 Golden and is nothing less than that. persona 4 was a fantastic game for any RPG player who enjoys good story and good characters, persona 4 Golden in was in enhanced experience for the people who loved.The original keeping everything that was good but with more added on to it. 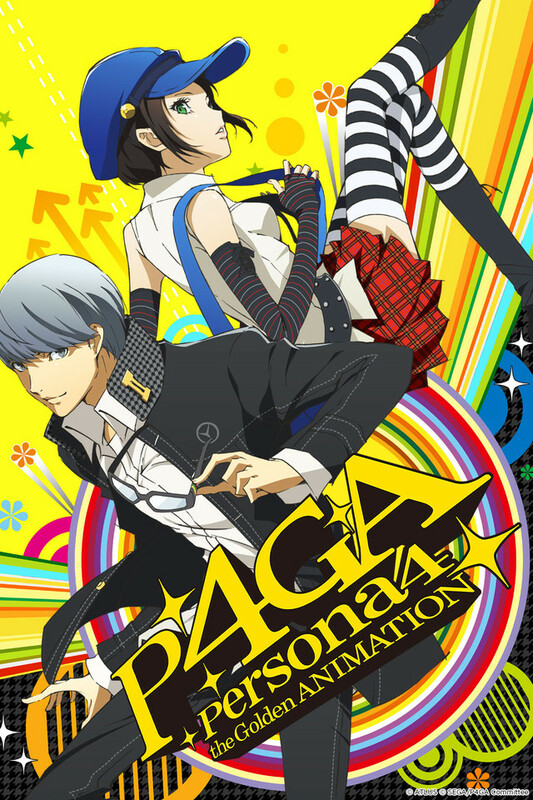 just as persona 4 was adapted into a anime for the fans this was created for the fans of the Golden addition and as that's focuses on what the people loved most about it. this is a love letter to the fans on behalf of its creators and anybody who has ever seen or played persona 4 would find this a worthwhile series.